NOTE: Before purchasing, check with your instructor to ensure you select the correct ISBN. Several versions of Pearson's MyLab™ products exist for each title, and registrations are not transferable. To register for and use Pearson's MyLab products, you may also need a Course ID,which your instructor will provide. From opinion polls and clinical trials to self-driving cars, statistics influences and shapes the world around us. 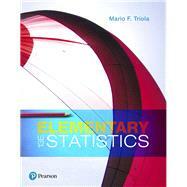 Best-selling author Marty Triola is committed to keeping Elementary Statistics relentlessly current – with an unprecedented amount of up-to-the-minute real data – so that readers of all backgrounds understand the role of statistics in the world around them. In addition to an abundance of new data sets, examples, and exercises, the 13th Edition is designed to be even more flexible, with the addition of learning objectives as an organizational tool, larger data sets, and new topics in line with advancements in statistics. In addition, readers will find more support in an all-new series of videos, more opportunities for practice, and improved support for statistical software. Personalize learning with MyLab Statistics.